Hope Sewing is Genetic: English Paper What? Crafting hobbies don't live alone, do they? People aren't "just" quilters, embroiderers, knitters, or whatever. Once you start quilting, well, it's only a matter of time before you do one of those nifty quilts that include bits of embroidery, which gets you to just embroidering things to have something to do in front of the tv, and so forth, right? I guess my new hobby is sort of quilting, but it feels different so I'm going to say it is. 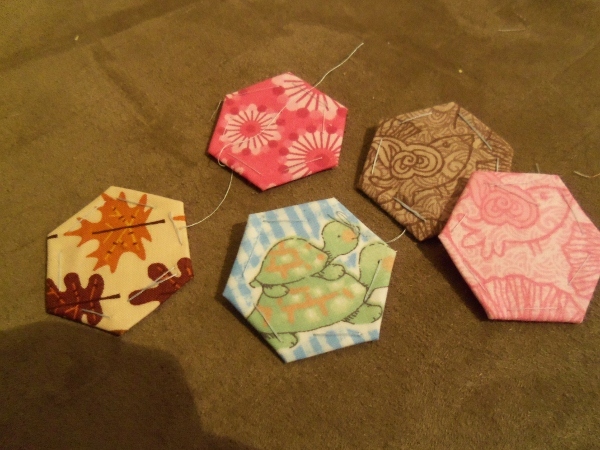 I've recently taken up English paper piecing - fed up with seeing all the OTHER bloggirls make adorable hexagons, I wanted to make some for myself. I combined the beginning of this venture with my attempt to organize/sort scraps, which really has worked out pretty well. I bought the die-cut papers that I'm using off eBay and they included a handy tutorial (including pictures! ), but here's one that I found online that you may find useful: summerfete's the basics of english paper piecing. I haven't gotten to the point where I'm sewing any together yet - right now, I just have this pile of scrap candy. Which includes favorites from projects past - the red from this finish, the purple stars from the quilt on our bed that I never properly posted a "finished!" post for, and the flowers...I think from these placemats? Yup, it's in there. Then my cat decided to get involved. Hopefully she doesn't think they're toys and scatter them everywhere by the time I get home from work! If you'd like to join in on the hopping, follow that link right up there - you do have to pre-register for the hop...which in a way is really nice, because you get a handy e-mail sent to you so you don't forget the rules and the dates and all that! Have a great day, readers! Clare has great instructions and fab inspiration, you'll be doing the rose star next! 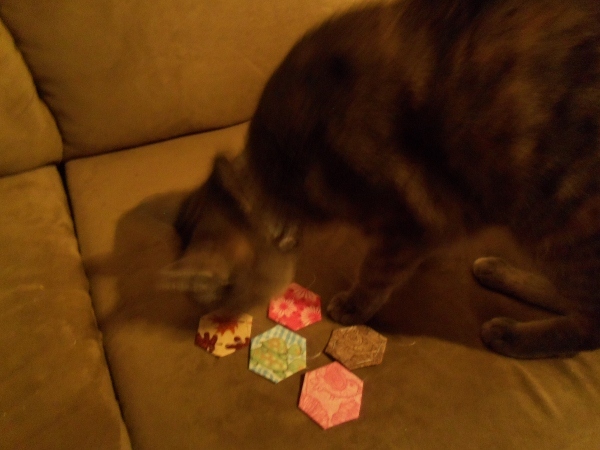 The hexies are really cute, will you be making a quilt or something smaller? Paper piecing was my first foray into quilting, and it got me hooked. I love your hexies, especially the tiny turtle - he's so cute! 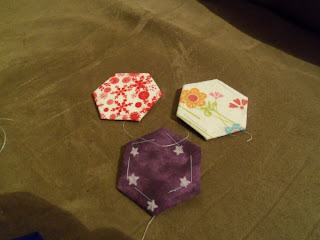 lol...wonderful hexies...I just started making them too. Posted a blog showing my Very First Hexie!! (as if that is something special....lol....well, it was to me). I am enjoying them. It's fun to do when I just don't want to head to the sewing room but I still want to do something with my hands. 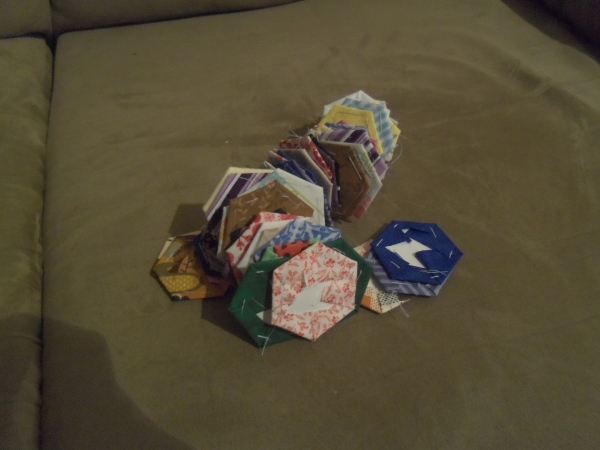 I've used a charm pack to make mine since my scraps are still very limited. Can't wait to see your progress!